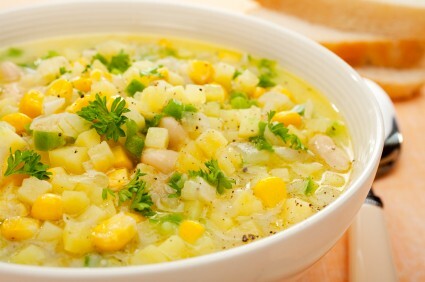 Hello, Dear Readers Welcome To Millionvisitars, Today We Going To Learn How To Make Corn Chowder Soup. It Will Take About 20-30 minutes For 2 peoples serve. A salt for taste, a pinch of black pepper powder and cheese if you want. Kept sweet corn in microwave for 2 minutes. Heat the butter in a pan, first boil little bit potato in that then add red capsicum, onion, and sweet corn. Roast it for 1-2 minutes and add 2-3 cup water and boil it. Take some water and flour mix them well and then add to it and boil. Add chili powder, salt, and black pepper powder, when the stew is hot add cheese and mix it well and serve it to your dear once. Serve it with toasted bread.